Idea: Maybe Ready for Hillary, the most visible and thirsty PAC pushing a Hillary Clinton presidential run, should consider no longer selling in their store items featuring a picture of Hillary Clinton checking her email. Because, you know, given the fact that there was a whole scandal about her email and private servers and secrecy, photos of the former Secretary of State checking her email whilst wearing sunglasses almost kind of looks like anti-Hillary propaganda. I can't imagine the people behind Ted Cruz's American Flag On Fire logo could have come up with something so clever even while wearing their most high-powered thinking caps. 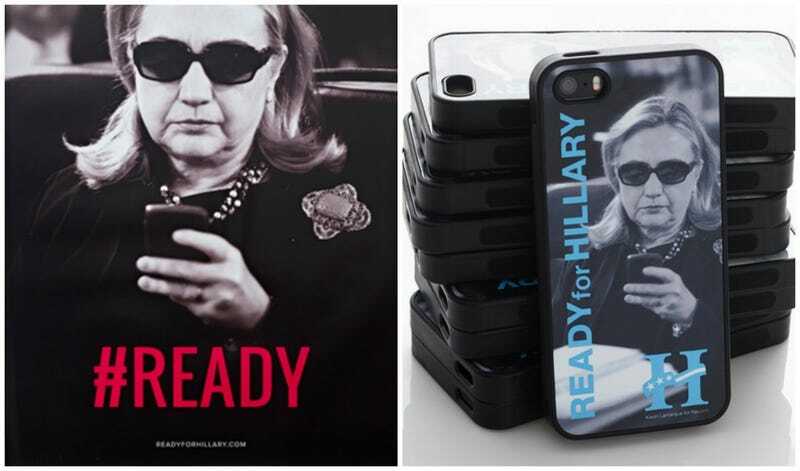 For interested parties, as of about 10 am EST, the 24X36 poster with ominous red text reading HASHTAG READY and the iPhone 5s case featuring less-ominous but still sarcastic-seeming-in-light-of-recent-events text "Ready for Hillary" are both available for purchase at the cheeky price of $20.16. Here, I must point that I am by no means an expert. I did not major in political science. The bulk of my political experience involves me making a 150-item list of insults for the 2012 Republican primary field to help ease my stress while watching every single debate and eating chicken fingers while crying during the 2012 Republican National Convention and almost hangover barfing on conservative radio talk show. But this just seems like a bad move, maybe.